Sue Peney, affectionately referred to as "Moma," lost her only child on June 1, 2010, to the Global War on Terror. For his selfless act of valor on the day he lost his life in 2010, Moma's son, Army Ranger, Sgt. Jonathan "Doc" Peney was awarded the Silver Star. "Moma" Sue Peney attended the first Kentucky Veterans of the Year banquet in 2014. She loved the banquet and the message the Kentucky Veterans of the Year conveys. Presented with the knowledge that some veterans may not be able to attend the banquet and feel the sense of pride in being a veteran because they just can't afford the ticket price, Sue worked with the Kentucky Veterans of the Year to establish this "Veterans' Grant Ticket Fund" in honor of her only son, Army Ranger Medic, Sgt. Jonathan "Doc" Peney. We hope you will join "Moma" Sue in honoring her heroic son by purchasing a ticket or tickets to the banquet that may be given to a veteran who could not otherwise attend due to limited financial resources. 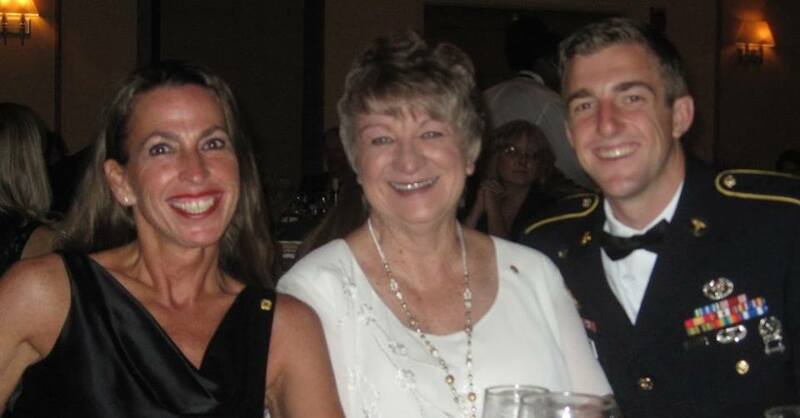 Will you honor this heroic Army Ranger Medic and his still devoted loving mom by purchasing a ticket to give away to a veteran? Former Miss America and Deputy Commissioner of the Kentucky Department of Veterans Affairs, Heather French Henry, is famous for saying, "We honor those who died, by serving the ones who lived." If you would like to Honor Army Ranger Medic, Sgt. 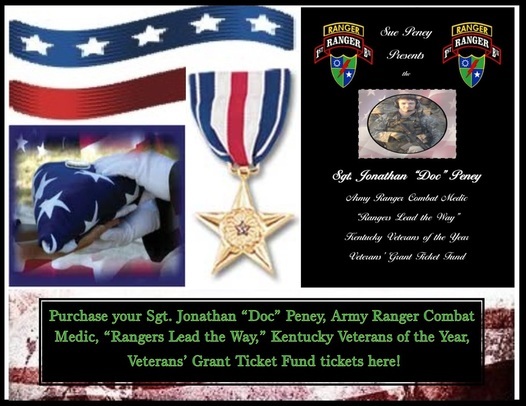 Jonathan "Doc" Peney by purchasing a ticket to the 2016 Kentucky Veterans of the Year for a veteran(s) who otherwise could not attend the banquet. Will you serve our living veterans in this way? The President of the United States of America, authorized by Act of Congress July 9, 1918 (amended by an act of July 25, 1963), takes pride in presenting the Silver Star (Posthumously) to Sergeant Jonathan Kellylee Peney, United States Army, for gallantry in action from 31 May to 1 June 2010, during combat operations against an armed enemy of the United States, as a Ranger Platoon Medic for a joint task force in support of Operation ENDURING FREEDOM. Sergeant Peney displayed selfless courage and overwhelming dedication to the members of his Ranger platoon in maneuvering through enemy fire to provide medical treatment for a wounded comrade. Without hesitation or regard for his own personal safety, Sergeant Peney climbed to an elevated position to provide medical treatment for a critically wounded Ranger, knowingly exposing himself to effective enemy fire. While moving to treat the casualty, Sergeant Peney was mortally wounded. Sergeant Peney's distinctive accomplishments are in keeping with the finest traditions of military service and reflect great credit upon himself, this command and the United States Army.NARRATIVE TO ACCOMPANY AWARD:Sergeant Jonathan K. Peney distinguished himself through exceptionally valorous achievement from May 31 to June 1, 2010 while serving as a Ranger Platoon Medic in support of Operation ENDURING FREEDOM. During the night of May 31, Company D, 1st Battalion, 75th Ranger Regiment executed a helicopter assault raid on an objective in order to disrupt the enemy. Following insertion by helicopter, the ground force completed their maneuver to clear the objective area and establish security, in order to remain on the objective and continue operations throughout the following day. Shortly after dawn, the ground force was effectively engaged by multiple concealed enemy fighting positions from the South, East and West of the objective area. Just moments after making contact with the enemy, a Ranger Team Leader positioned on a rooftop on the northern end of the objective was shot and critically wounded. With an intense volley of effective enemy machine gun fire impacting the rooftop and the adjacent outer courtyard walls, it was clearly evident that the enemy was targeting the squad that was pinned down and exposed on the roof. The enemy was in the midst of what would turn out to be a superbly coordinated attack on the platoon from three different directions at varying ranges of 150-300 meters and lasting nearly an hour. The automatic weapons fire was so intense and effective; it was unfathomable that the platoon did not sustain more serious casualties at this point. With the squad pinned down in a prone position and a Ranger Team Leader gravely wounded and suffering a tension pneumothorax, the squad called out for a medic. Sergeant Peney, the ground force medic, received the call from the platoon sergeant requesting medical treatment for the wounded team leader. Sergeant Peney was centrally located in the main courtyard and answered the summons. Sergeant Peney moved to the base of the ladder on the South wall of the compound. Without hesitation and with total disregard for his own personal safety, Sergeant Peney knowingly climbed through the barrage of effective enemy fire in a valorous attempt to reach the wounded team leader and provide him with critical medical treatment. At the top of his climb, when he crested the rooftop, Sergeant Peney was mortally wounded by enemy fire. Sergeant Peney's valorous actions under direct fire and his overwhelming dedication and commitment to the welfare of his ground force on the battlefield inspired the men of the platoon to gain fire superiority over the enemy. The platoon answered with an overwhelming volume of fire to cover the egress of the pinned down squad and the casualties off the roof of the target building. Throughout the remainder of the day, the platoon repelled numerous enemy attacks on the objective area. Sergeant Peney's selfless actions and tremendous fortitude in the face of a heavily armed and well trained enemy earn him great distinction among his peers as he knowingly and willingly climbed into a hail of gunfire to aid his critically wounded Ranger buddy. Sergeant Peney's valorous actions reflect great credit upon himself, the 75th Ranger Regiment and the United States Army.